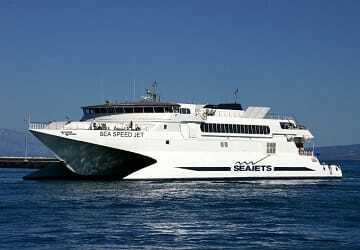 Sea Speed jet is a Catamaran/Passenger ferry built in 1990 in Australia. Sea Speed Jet can carry up to 700 passengers onboard and has space for around 50 vehicles in its garages. Facilities are relatively limited due to the style of ferry but there’s enough onboard to keep you entertained during your crossing. Please Note: Whilst we have taken great care in making our Sea Speed Jet guide as accurate as possible, onboard facilities, services and entertainment may vary depending on the date and time of year that you travel, facilities mentioned may change without notification and ferry companies reserve the right to operate vessels other than those mentioned at time of booking without prior notification. We really enjoyed it, excellent trip, clean ship, all kind and friendly. It was very easy to book with Direct Ferries and it was easy understand how to do it. The trip between Piraeus and Naxos was very beatiful with lots to look at. Now to what was most irritating with the trip which is the reason I will never travel with Sea Jets again. When we were leaving from Piraeus we had to wait 40 min before we finally left the port. It was 30 degrees and no shade! People became really upset and got no information at all about what was happening. When we finally got onboard we got no information that the ferry was supposed to be 2 hours delayed. The trip that was meant to take 3 hours took nearly 6 hours. A tad irritating when you've paid extra for a faster trip. The staff onboard were happy because they sold lots of food and snacks. I really don't recommend Sea Jets and will not travel with them again.